In 1992 this 100m ferry boat which was on its way back from the Mecca sunk and is now lying on it's side on the bottom of the Red Sea. One of the biggest reefs in Safaga. Huge coral formations. Walls dropping to over 200m. Numerous grottos and overhangs, gorgonians and soft corals. Jack fish, Barracudas and Reef Sharks often visit the area. Even Hammerhead Sharks have been seen by early morning divers at the end of spring. The North has an interesting plateau and on its drop off beautiful black corals. Resident Barracuda schools and turtles. Sometimes Reef sharks can be seen there. Its Southern part has a drop off at 30m and at the outer reef different kinds of sharks are to be seen there In the winter time Manta Rays glide up from the big blue. This is a rarely chosen dive site in the South of Safaga. For this reason the place is still quite virgin . The North side is a drop off descending to 80m . Tuna; Barracudas, Turtles and Sharks can be seen there. Perfect place for drift dives. The Southern part boasts beautiful coral gardens letting you feel a touch of paradise. A part has also got caves and canyons. 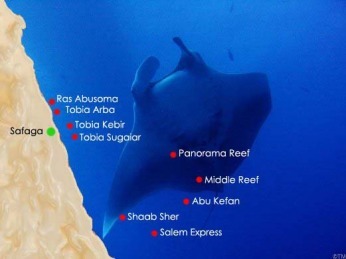 This reef is located 7 km beyond Ras Abu Soma and diving is only possible in good weather. With strong Northern wind anchoring is only possible in the shelter of the reef. The reef wall goes down from 15 meters to about 25. The wall consists of several caves with schools of flute fish. You might even encounter grey reef sharks. In good weather most of the diving is limited to the coral tower at the north side of the reef. This is a real garden with incredible hard coral formations at a depth of 15 meters. This area can be reached in bad weather. To the north there is a plateau of coral blocks at a depth of 15-17 meters, which slopes down to a depth of 30 meters. The surf disturbs the reef side and the diving is only interesting along the reef wall. The danger is in the constantly changing currents and before diving it is very important to know its direction. Alternatively there is the south side where the reef wall ends at a depth of 8 meters from and a coral garden slopes down to 25 meters. Many moray eels and crocodile fish may be found in and around the coral blocks. These seven pinnacles rise from a depth of 12 - 15 meters from a sandy bottom, which slopes down to the south to about 25 meters. The tops of the pinnacles reach near to the surface and are covered with beautiful soft corals. To the south there is a cave. The inhabitant, a great grouper only shows himself when not too many divers are around. At the second pinnacle is an anchor line. A lot of lionfish live around the pinnacles. Between the second and third pinnacles to the north there is a beautiful canyon at a depth of 4 meters. This is an ideal place to meet hundreds of groupers. A 2 km long reef wall depth 5 to 25 m. where at the south side Sandy Island is located. It is not very deep and goes down to 8 meters. The coral garden is 20 meters wide at the south and up to 50 meters in the north. Between the coral blocks you will find blue spotted stingrays and crocodile fish. In the east the coral garden changes to a slope, which reaches a depth of 36 meters. This is a good dive site for afternoon diving. This reef can be visited in windy weather. The mooring line is in the south of the reef in a small sandy lagoon at a depth of 5 meters. Eastwards you can visit a field of sand eels. The best dive is along the passage through the reef, around the southern coral blocks (12m) and then following the reef wall up to the North. This reaches a maximum depth of 20 meters. After a few meters at a depth of 5 meters you will reach a grotto. The whole east wall is covered with hard coral. The west side is not interesting. Here you will find a group of coral blocks along the length of Tobia Kebir. With an average depth of 11-15 meters, an ideal place for second dives. The best way to dive is in a horseshoe shape. Starting in the southwest is the biggest coral block, which is divided by two small canyons at a depth of 3-4 meters. The most beautiful coral is to the north there is a line of small corals, which reach up to Tobia Kebir. Following the horseshoe to the south we reach a small rock after the second largest coral block. In the north there is a little grotto and large moray eels visit the west side. Further south you will find two small blocks with a resident grouper. From here the return is made to the boat by the sandy slope. This is a long reef, which becomes wider on the east side. Mooring to the south, there is a depth of 8-10 meters. To the east at 15 meters depth there is a field of sea eels. The reef wall on the north goes down to 11 meters and has lots of beautiful groups of coral. Groupers are often found near the top of the wall. In the north-east direction there are two very encrusted small coral blocks at about 5 meters from the surface. Situated by the north end of Safaga Island, this site includes a lagoon and an area of sea grass at 6-9 meters to the south. However the best diving is from the east up towards the north. There is a beautiful coral block at 12 meters, about 20 meters away from the reef wall, which normally has a lot of groupers. Further north at a depth of 18 meters there is a beautiful coral block in an L-shape. The north side of Gamul Kebir goes down to about 15 meters with beautiful hard coral. At a depth of 9 meters there is an entry to a small grotto. This small island which is also called "Sandy Island" is surrounded by shallow turquoise water corals starting almost at the surface and gently sloping down to to25m. The island is regularly visited by snorkellers and charter boats for BBQs on the beach. This spot is ideal for beginners. Two small coral head with lots of soft corals , Barracuda and Napoleon fish seen during morning dives. 2 km long reef with wonderful coral garden and caves. The Northern part is ideal for drift dives. The outside of the reef slopes down to 40m. with beautiful soft corals. Moray eels and sometimes Eagle rays are seen there .